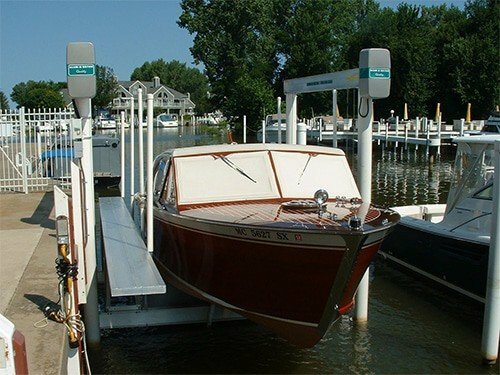 A superbly engineered gear-driven boat lift, the Imm Quality Alumavator sets the industry standard for shafted beam boat lifts. The Alumavator is chain driven at the winder shaft from a motor-driven gearbox. Chain drives are the transmission of choice for heavy machinery in industrial, farming, military and marine applications because of the shock-load ruggedness, efficiency, safety and proven battle-tested dependability. This positive drive system does not suffer from belt slippage seen with flat plate drives because each link makes a drive contact on the sprocket, spreading the load over many teeth. Chains are simply the best drive choice for the money given the extreme abuse of the marine boat lift application. We take pride in our engineering and product design expertise along with our unique capability to thoroughly performance test our lifts before they leave our factory. 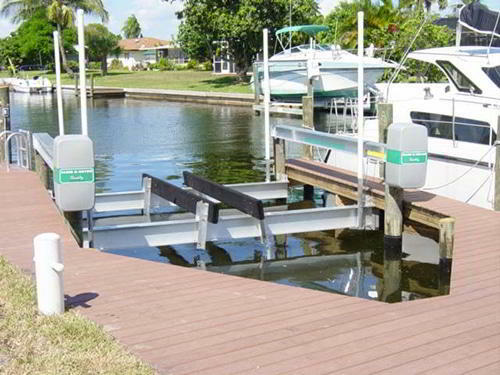 Take a look at our design and see why IQ boat lifts are Built for a Lifetime. Patented wedge locks allow the cables to be pre-wound for easy installation and allows the cradle system to be easily adjusted after installation. 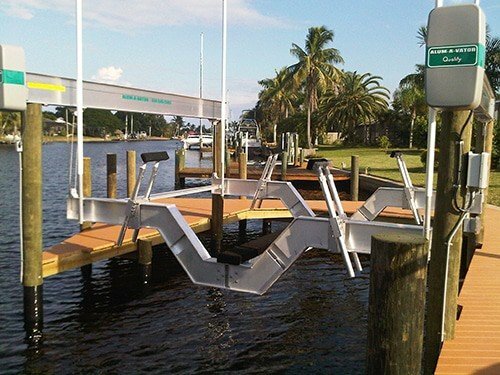 The Alumavator boat lift is available in seven sizes in the four piling configuration up to 27,000 pounds, and in three additional sizes in the eight piling configuration up to 54,000 pounds. Specifications are shown in the following chart.